Home › Finance › Crowdfunding › Has the US Equity Crowdfunding Market Lived up to Expectations? To be clear, the process of raising money from private investors is nothing new. However, in most countries, including the US, there have historically been rules regarding such an activity that tended to exclude the average person on the street from investing in these deals. In the US for instance, in order to invest in the equity of private companies, individuals needed to be approved accredited investors, or go through regulated middlemen, both of which limited the playing field and created barriers to mass participation. The JOBS act, and the promise of equity crowdfunding, changed all that. Nearly five years on though, equity crowdfunding continues to remain a fairly limited niche activity. Despite a few success stories, the grandiose predictions of industry-wide disruption haven’t come to fruition. In this article, we take a look at the current state of the equity crowdfunding market in the US, and assess the challenges it needs to overcome in order to live up to its promises. The current state of the equity crowdfunding market in the US can be summarized quite easily: The market continues to be very small. In the last twelve months, there have been several high-profile equity crowdfunding campaigns which have raised non-insignificant amounts of capital for early stage companies (Chart 1). Nevertheless, the biggest takeaway from the data is that the market continues to be very limited in size. While no authoritative studies on the size of the market have yet been completed, the best analysis on the subject comes from a study by Wealthforge, a private capital markets platform. 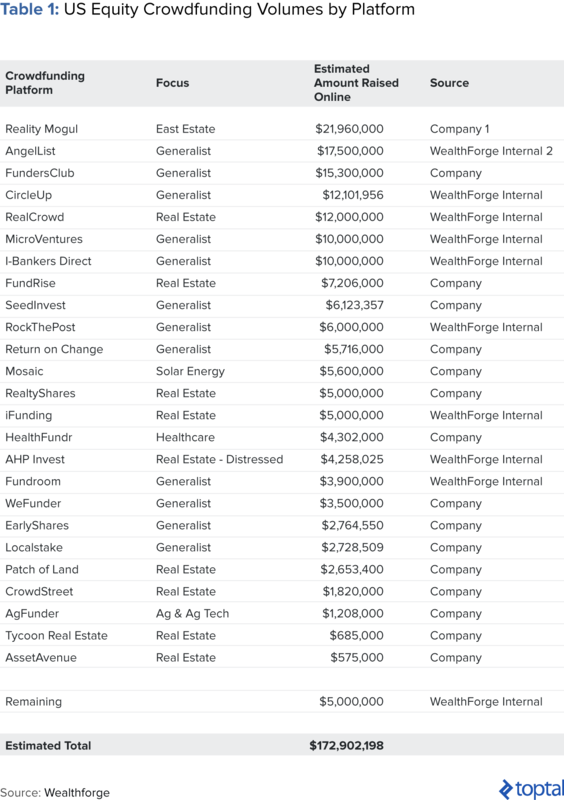 Citing unconfirmed sources from the top US platforms, Wealthforge places the size of the US equity crowdfunding market at just $173 million in 2014 (Table 1). Comparing these figures to their closest “rivals” reveals the tremendous amount of catch-up that still needs to occur. 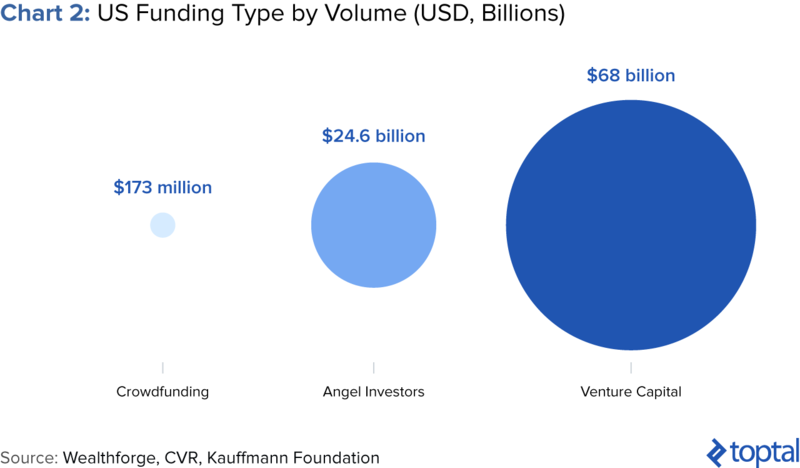 For instance, even though data is scarce, the size of the angel investment industry in the US for 2015 was estimated at $24.6 billion by the Center for Venture Research. The venture capital industry is of course much bigger, and the Kauffman Foundation puts the size of the industry in the US at $68 billion in 2014. Turning away from dollar amounts and looking at number of companies raising via these different avenues, the picture is still roughly the same. In its 2016 Trends in Venture Capital Report, the Kauffmann Foundation estimates that the number of firms raising from venture capital funds and from angel investors stood at 7,878 and 8,900 respectively for 2014. This compares to 5,361 for firm raising via crowdfunding as a whole (i.e., including all forms of crowdfunding, not just equity crowdfunding), which means that the equity crowdfunding number is only a small fraction of this (the vast majority of crowdfunding campaigns are either in the peer-to-peer lending space or in rewards-based crowdfunding platforms like Kickstarter). So, data accuracy issues aside, it’s clear that the equity crowdfunding market in the US is a) still extremely small relative to other equity funding sources at the startup and venture stage, and b) is currently used primarily by very small and riskier companies as opposed to higher growth technology startups or more established companies. Why Is the Industry Still So Small? Given the above conclusion, the relevant next question would be to ask: Why hasn’t the industry lived up to its potential (yet)? What are the reasons for the market’s still relatively insignificant size? The answer to these questions is actually fairly straightforward: The principal reason for the market’s limited size to-date is that the JOBS act only finally kicked into effect in May 2016. In and of itself, this is a surprising outcome. After all, the JOBS act was passed with overwhelming bipartisan support back in 2012. Nevertheless, the SEC, the agency tasked with protecting investors, took over three years to finally publish the details of how the law would work. Reading the above, and returning to our original question of whether equity crowdfunding has lived up to its promise, one might quickly conclude that it is too early to tell. And our assessment would be the same. Nevertheless, despite the above, we foresee a number of challenges the industry will have to resolve before we can expect it to see significant growth. The first reason why we remain cautious on the industry’s immediate growth prospects is because it is likely that the market will soon be rocked by high-profile scandals involving investor fraud. For an industry that is still in its infancy, early setbacks in the form of headline-grabbing cases of fraud are likely to severely hamper the industry’s growth prospects in the short-to-medium term. The second reason why we remain cautious on the industry’s immediate growth trajectory is that, fraud aside, early equity crowdfunding investors are likely in for a cold shower. After all, investing in startups is a risky business. 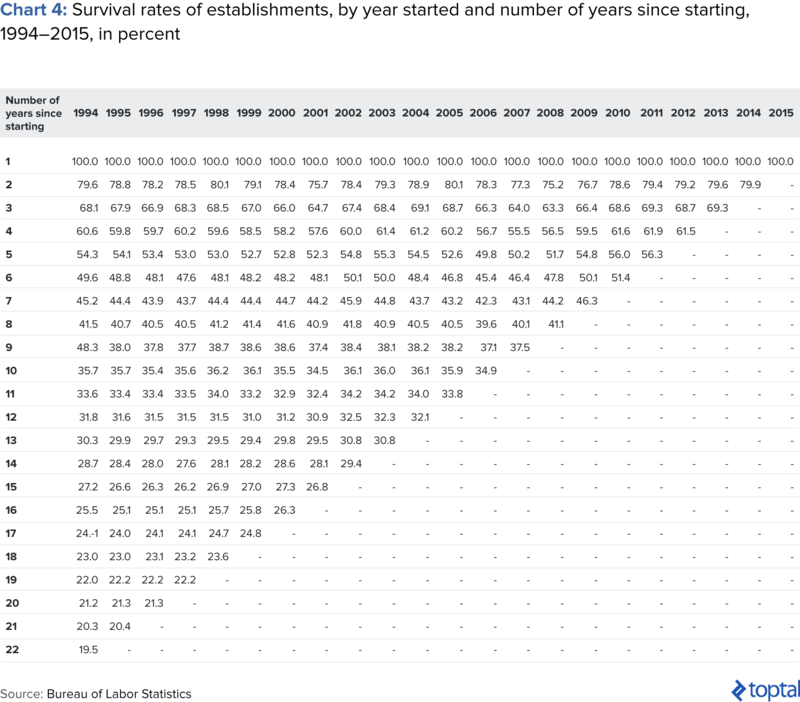 The US Department of Labor estimates that the survival rate for all small businesses after five years is roughly 50% (Chart 4). For high growth technology startups, the picture is even bleaker. A study co-authored by Berkeley and Stanford faculty members with Steve Blank and ten startup accelerators as contributors, found that within three years, 92% of startups failed. The above therefore means that in most cases, investing in startups means losing one’s money. Sophisticated investors of course already know this, and several theories regarding optimal portfolio allocation and distribution have been developed. Peter Thiel for instance popularized the notion of the Power Law with relation to startup investment, and Fred Wilson famously outlined his views on the “VC batting average.” But the point is that these are sophisticated and knowledgeable investors, who have over time developed and refined their skills and networks to achieve success. But most equity crowdfunding investors likely are not, and will therefore probably see poor returns on their investments. All of the above strongly points to high failure rates and poor returns in the immediate term. And no doubt the consequence of this will be that equity crowdfunding investors will turn to more experienced and knowledgeable third parties to perform deal and company evaluation and assessment. But who should take on this role? Nevertheless, notwithstanding the question of who ends up taking on the role of “gatekeeper,” the more general point is that if gatekeepers become the norm, the original thesis of equity crowdfunding is called into question. After all, the essence of it all was to remove friction and middlemen and allow anyone to invest. Introducing gatekeepers goes against that. In the same way that investment banks and brokers only work with clients that fulfill certain criteria (which usually involve a minimum net worth or amount of investable capital), it wouldn’t surprise us that these future “gatekeepers” of the equity crowdfunding industry begin doing the same. And if that were to happen, we’d essentially have gone full circle. Turning further ahead, another problem that this nascent market is likely to soon face is the lack of a liquid secondary market. Equity crowdfunding investors will at some point need to cash out of their investments. Given that most startups take years before a sale or other type of liquidity event occurs, unsophisticated investors who are uncomfortable with their money being locked up for 7-10 years will likely shy away from the asset class as a consequence. The SEC itself is aware of this issue, and already back in 2013 had recommended that “the U.S. Securities and Exchange Commission should facilitate and encourage the creation of a separate U.S. equity market or markets for small and emerging companies, in which investor participation would be limited to sophisticated investors, and small and emerging companies would be subject to a regulatory regime strict enough to protect such investors but flexible enough to accommodate innovation and growth by such companies.” However, to-date, the agency has yet to give the green light on the proposal. Were such a market to eventually emerge, it would still face some of the challenges we mentioned above. Unsophisticated investors would likely be faced with valuation challenges when it would come to selling their shares. And fraudulent selling practices would likely emerge to harm secondary buyers. In the same way that trading on the public markets is a highly regulated activity, a liquid secondary private market is most likely going to follow a similar path. Despite all of the above, a smart, focused, and thoughtful strategy of investing in equity crowdfunding deals could work out quite well for investors. 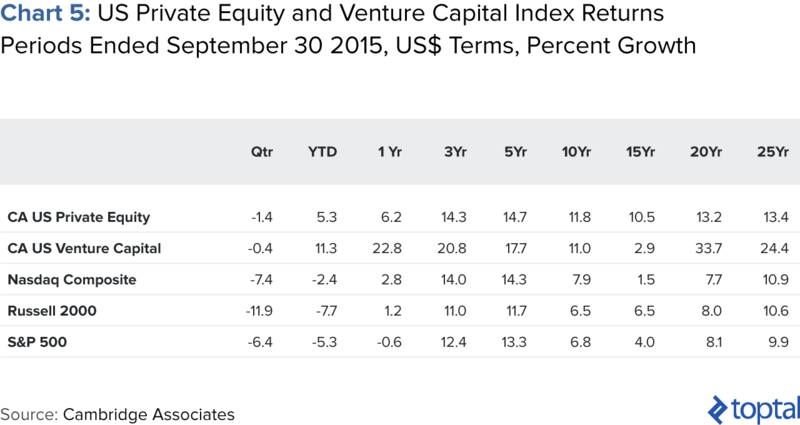 After all, as an asset class, venture capital has some pretty decent returns. Cambridge Associates for instance found that its U.S. venture capital index outperformed other indexes over most time periods (Chart 5). Diversify your portfolio. A time-tested practice amongst investors, portfolio diversification is key to ensuring that you doesn’t have too much single-name exposure to one asset. There are obviously techniques for portfolio diversification which include diversifying across sectors, across business models, across funding stage (which wouldn’t apply in this case), but whatever the case, make sure to have a nicely balanced and diversified portfolio. Here’s an interesting article to get you started on the topic. Don’t invest too much of your personal wealth. Limit your own personal exposure to this asset class. Given the highly speculative nature of seed/venture investments, you should limit your personal net wealth allocation to the asset class to only a small part of your overall portfolio. Exact amounts will vary on financial circumstances and your risk appetite, but a good rule of thumb could be 10% or less. This article delves into the topic a little more. It in fact suggests that most “large asset pool managers would like a 5–10% allocation to venture capital because of its past returns and anti-correlation with other asset classes”. Do as much diligence on the investment opportunities as possible. Understand the business model. Try and speak with the company executives. Understand the market. Look at the company’s financial performance and traction to date. Does the founding team have solid backgrounds? Do the founders complement each other? Asking lots of questions is always better than not. Perhaps focusing at first on a business model or industry which you know very well would and in which you have an “unfair advantage” would be a good way to start. Due diligence on venture investment opportunities is an art, not a science, but here is an interesting article by one of the smartest venture investors around on the subject. Vet the platform. Make sure that the platform through which you are investing is legitimate. Have they had successful campaigns before? Reach out to other investors to see what their experiences have been with the platform. Does the platform perform any of their own due diligence on the opportunities? If so, what are the criteria? Read through the terms and conditions very carefully. This article goes into this topic further. As we’ve outlined above, we have significant doubts on the market’s prospects to fundamentally disrupt the funding landscape for small businesses any time soon. Cases of fraud, poor returns, a lack of exit alternatives, and a questionable value proposition all point to subdued growth over the short-to-medium term. And putting these aside and taking a step back, it’s probably worth asking oneself if the average person on the street, the very person that the JOBS act was intended to target, is really even interested in investing in such a risky asset class. Yes, equity crowdfunding does “democratize” the field and allow anyone, not just the rich and powerful, to be angel investors and venture capitalists. But does the average person on the street really want that? However, despite the challenges, we’d like to argue that equity crowdfunding is a noble cause worth fighting for. It may have its challenges, and its true worth may be less than what the hyperbolic market evangelists initially claimed, but at its core, equity crowdfunding is about fairness and equal access, two things worth striving for. After all, returning to the status quo of only “accredited” individuals being allowed to invest in private companies doesn’t seem right. Allowing anyone, not just “sophisticated” investors, the right to invest in the next Snapchat or Airbnb feels like a fairer situation, albeit one that involves significant financial risks for those who choose to partake in the market. Toby is the founder of Petsy, one of Mexico’s leading eCommerce companies, backed by the region’s top VC funds. As he transitions out of day-to-day operations from his company, Toby likes to freelance on projects where he can add significant value, such as financing related projects, market research, and valuation analysis. Toby has worked extensively with senior executives at VC- and PE-backed high growth companies in Europe and Latin America.